is located on the beautiful Island of Kauai at the Waipouli Beach Resort in Kapaa. We offer a wide range of spa and wellness services as well as indulgent packages. Pamper yourself or someone you love with one of our luxury spa packages. 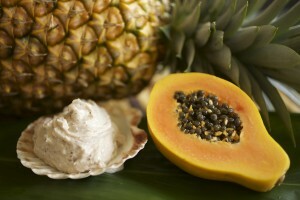 We exfoliate your skin with our papaya pineapple body scrub. 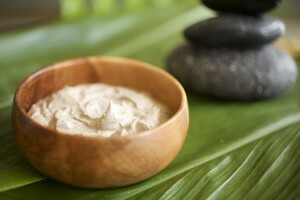 Then pull the toxins from your body with a volcanic clay body wrap. Followed with a kukui coconut lotion massage. Enjoy our relaxing couples beach get away. 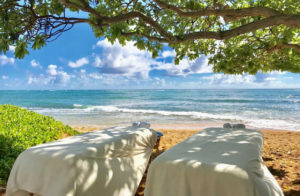 This package offers an 80 minute kukui coconut milk massage on the beach next to your loved one. Join us for a full day of relaxation. This package offers an exfoliating papaya pineapple body scrub, a volcanic clay body wrap, Vichy shower and a relaxing 80 minute kukui coconut milk massage and hot oil scalp treatment and a 30 minute facial. Lunch from Oasis Restaurant is included and served between treatments. Spa by the Sea offers Bikes & Beach accessory rentals for visitors and locals. We have bikes for all ages. All bike rentals come with a helmet and a bike lock upon request.